Would you like to have better solutions to your problems? Struggling to understand why things went wrong when you did everything right? The Art of Thinking in Systems can help you with these problems. You think systems thinking is for politicians, and powerful CEO's? Let me tell you this: a small business is a system, your class at school is a system, your family is a system. You are the element of larger systems - your town, your country, the world. These systems have a different dynamic. The more you know about their nature, the more optimal solutions you'll find to problems. The narrator was good but the book clearly lacks practicality. 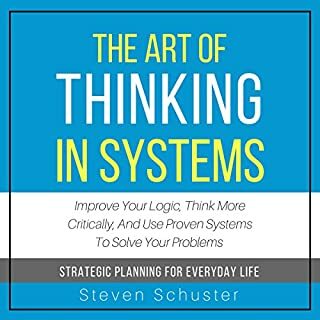 The book starts with a lot of promises but I wish we have been provided with some frameworks or other tools we cann use to develop system thinking and improve our decision making. So I am still on my thirst because I bought the book with the aim of improving my decision making process.